This is the first article of a seven part series on how to create your own social media strategy. 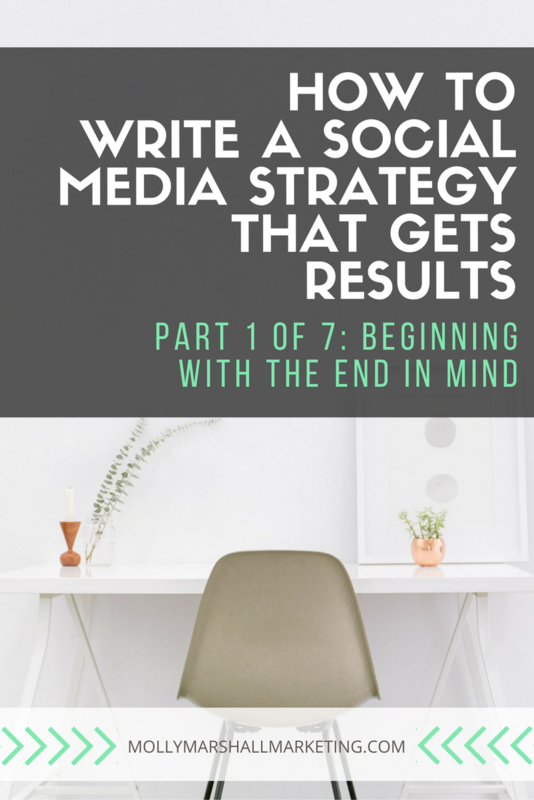 In these seven articles I’m literally going to be taking you behind the scenes and into my process of writing social media strategies for clients. 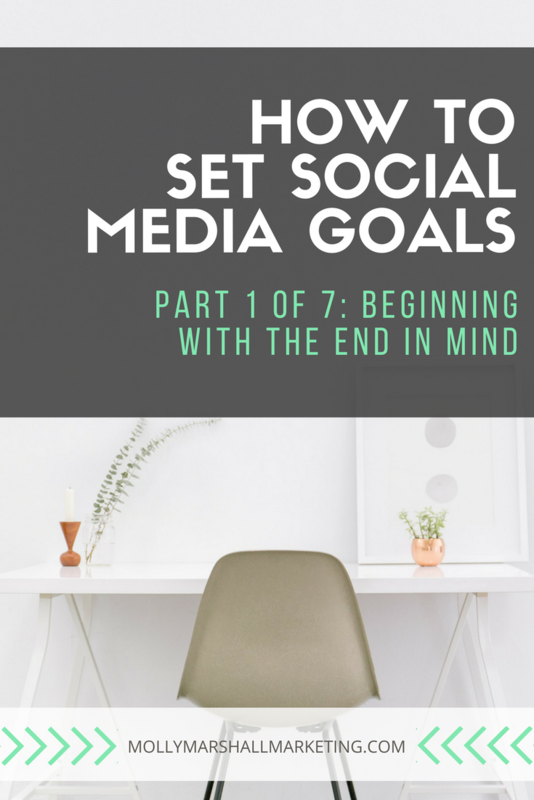 Today I’m going to talk to about how to set social media goals. 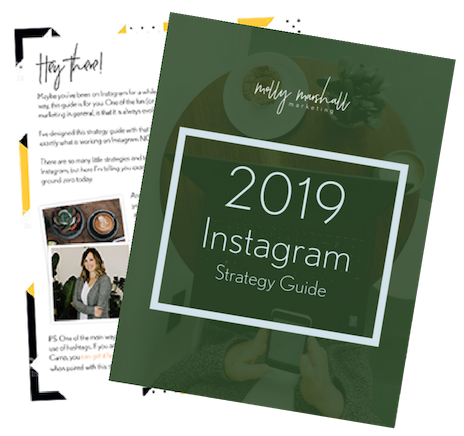 If you aren’t 100% sold on the fact that you should even have a social media strategy, I highly suggest you go back and read my post about why you need a social media strategy. Even I have my own, documented social media plan. When business gets crazy and you feel like you are spinning around in circles, it helps to be able to remind yourself that everything you are doing has a purpose. Or it doesn’t. And in that case your strategy needs to evolve. Every time I sit down with a client, I am trying to identify what they need more of in their business. Duh, we all could use more sales and customers, but the reality is we don’t always get exactly what we need directly from a social media post. In fact, it’s rare to actually sell anything from a social media post. Most people don’t see an item, click the link, and buy it in that exact moment. Many (most) people see something, think about it, maybe research it, and then buy it. Or they don’t, but they plan to way in the future. For instance, I’m not going to buy a Land Rover tomorrow when I see whatever gorgeousness Land Rover USA posts on their Facebook page. But I absolutely plan to buy a Land Rover in the future. It could be in 6 months from now, a year from now, or maybe a couple of years from now. For now, I just like looking at them. So, if you know you aren’t going to necessarily get sales (which would mean a new customer) from a social media post, what is the next best thing? Anyone that has worked in sales knows what “know your numbers” means. Every business has numbers, those averages or norms that you can depend on in your cycle of leads > customers > sales. For example, when I had a business with a direct sales company, us consultants all knew that for every person we presented our product to, we would make an average of $100. Does that mean I sold $100 every time? No. Sometimes I sold $300 and sometimes I sold $0. But if I looked at how many customers I talked to in a week, or a month, or a year year and did the math, it worked out to about $100 per person. If I wanted to make $1000 in a month I knew I needed to talk to 10 people. With an online business, your numbers are your conversion rates. We know that if you are converting 5-6% of your website visitors to your email list, you are doing phenomenally well. If you are selling 3-5% of those people your product, you are doing really well. So if you know what you need to sell in dollars, and you know how many customers you need, you can start to look back and figure out what you need for website traffic. You won’t drive all of your website traffic from social media, but you can start to paint a better picture of what you need and where you are going to find it out on the World Wide Web. Social media will be a piece of that. Your domino is the one thing that accelerates your business forward. You need sales. To sell you need customers to sell to. To have a customer they first must be a lead. To get a lead you need to have people finding you via search, social media, links from other people’s websites, press mentions, or however else. Think about what this means for you and your business. What will ultimately help you find more customers to sell to? If you don’t sell online, maybe website traffic to try to convert to an email list isn’t your ultimate goal. For a local business, all the website traffic in the world isn’t going to help you if you don’t have people walk through your bakery door and buy your cookies, right? 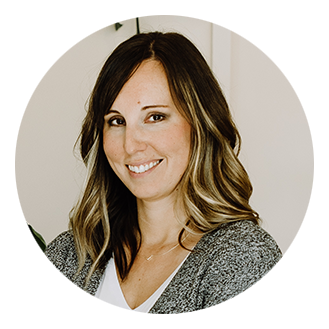 Although I love to work with concrete, measureable things like how many people came to my website, or how many people I added to my email list, that isn’t the only reason we use social media. Sometimes, if that is all we used to measure our social media success, it might look a little bleak. Particularly when you are just getting started. When you set social media goals, awareness, brand leadership, building your credibility and authority can also be great reasons to grow your social media presence. I know there are hundreds of other reasons people may want to use social media that I’m not even thinking of right now. Armed with this information, you now know that your social media efforts, like ALL marketing, should exist for a purpose. With your goals defined, much of the social media “noise” falls away because you know why you are even doing it in the first place, which will allow you to align your message to your audience, and align your content and your activities with your goals. Tell me, what is your MAIN goal for being on social media? Part 2: Defining Your Audience. The foundation for creating 1:1 conversations. Part 3: Setting Goals. Choosing your the “domino” that creates momentum in your business. I’m not sure 😉 The best way to stay on top of my blog posts though is to get on my email list, or follow me on Instagram… that is where I notify people! My main goal is to build brand awareness and connect with others running similar businesses. I’m really really new to running an online business and social media, and trying to keep realistic goals.